Recently, while working with a personal coach to grow as a leader, I was reminded of something I wrote in 2015 when my wife and I started out on our journey to plant a new life-giving and hope-sharing church in Eastern Virginia. At that time, we had no clue that God would lead us to an established church that would end up partnering with us to revitalize from a death-trending church to a new life-giving and growing church. Over a period of several weeks, I captured the thoughts that I had. At that time, even though I continued to write the word “revitalized”, I kept defending our decision to plant a church over partnering with an established church. I had zero desire to help turn a church around. I didn’t think I had the leadership qualities that revitalization would require, namely patience. I echoed what I had heard so many church planting mentors say; “it’s easier to give birth than to raise the dead.” I now know that’s only true if the dead want to stay dead because they can’t admit that they are dead. But a dying church still has great hope. Now, two years after writing these statements, I see that several of them are starting to live themselves out in the church plant that God lead us to do. A church plant that happened because a faithful group of believers voted to change everything about their church and merge with us. It’s only been five months since we launched, and we are just getting started. 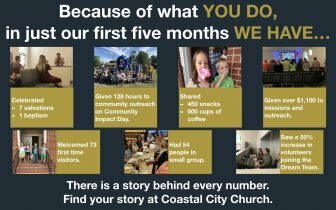 In fact, here is a recent graphic we shared with the church to show them what God has done through us in only five months. You need to know, there are problems with these statements. They are not word-smithed to be easy to read for people who don’t know church lingo. They aren’t designed to be memorable or poetic. These are just statements that came across my mind as I was reflecting. Some of them could cause people to say “but what about…..” or “that’s just a reaction to….” Again, these aren’t to be theological statements, and I wouldn’t recommend anyone getting a tattoo of any of them. They are merely thoughts I had as I worked on putting into a simple statement the totality of the vision we now have. I see a future with new and revitalized churches full of people surrendered to Jesus and in alignment with their spiritual gifts, passion, and personality working with urgency to reach people far from God. I see a future with new and revitalized churches working to make Jesus famous over the name of the church or the personality of the pastor. I see a future with new and revitalized churches with the best of the best growth-minded communicators, musicians, artists, storytellers, dreamers, builders, designers, leaders, administrators, change agents, and creatives all fully committed to Jesus to do whatever it takes, short of sin, to reach people far from God. I see a future with new and revitalized churches that are debt free, that take action only when resources and opportunity are present, aligned to God’s will and prayerfully and fully surrendered to God. I see a future with new and revitalized churches caring and providing for the needy, the orphans and the disadvantaged by connecting them to the hope of Jesus, equipping them with skills and walking the journey with them to self sufficiency where the only one they rely on is God through the Holy Spirit because of who Jesus is. I see a future with new and revitalized churches teaching a complete Biblical message full of Grace and Truth where people, through the love-filled life-giving convection of the Holy Spirit find their identity in Christ and not the world. I see a future where people turn to new and revitalized churches for instruction in studying scripture so people can learn Gods design for healthy finances, marriages, parenting, conflict resolution, emotional intelligence, and everything else we need to know to live an abundant life fully surrendered to Jesus Christ. I see a future with new and revitalized churches alive with enthusiasm for change for the sake of reaching those far from God. I see a future with new and revitalized churches where the staff equip the members to do the ministry and staff clear the path. I see a future with new and revitalized churches radical about connecting people in genuine small group communities where safety, accountability, spiritual growth, new friendships, and fun are experienced by all. I see a future with new and revitalized churches where people are more excited to move to welcome someone new than stay in a routine of comfort. I see a future of new and revitalized churches where teens are so highly engaged and experiencing life-giving change in a multi-generational service that they can’t imagine being anywhere else but in the local church at least once a week for corporate Worship and once a week in a small group for the rest of their life. I see a future with new and revitalized churches that lead a community to such a higher standard of living that property values increase. I see a future with new and revitalized churches that count people in services to make better operational decisions and count people far from God to make better ministry decisions. I see a future where people turn to new and revitalized churches from the arenas of; the arts and entertainment, business, education, the family, government, and media for moral direction, best practices, productivity, effectiveness, ethics, and social justice leadership based on doing what Jesus asks of us. 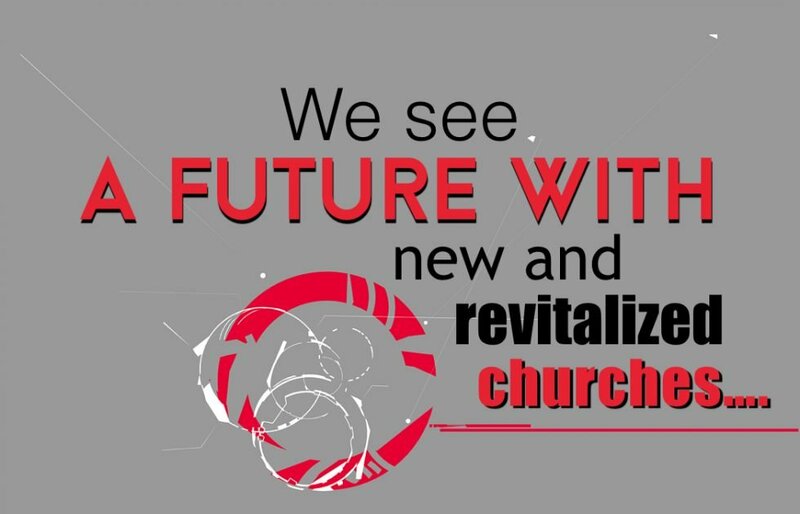 I see a future with new and revitalized churches that are connecting people to their personal God-ordained purpose that is more appealing to participate in than any attraction of sin on their life. I see a future with new and revitalized churches that are not afraid to speak the truth in love and embrace every word of the Bible, even the uncomfortable ones. I see a future with new and revitalized churches that are bursting with the love, mercy, grace, happiness, joy and peace of Jesus Christ and moved into action from a broken heart for people still far from God.